Can Save Your Life When Seconds Count! Chain tension tested to over 1,000 pounds! Corrugated box doubles as storage case! Can be easily and quickly deployed! Fits wall thickness up to 10 inches! Operating instructions in English and Spanish! Fires can engulf a home in 60 seconds! 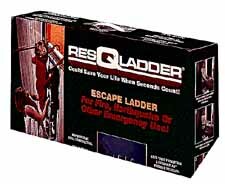 Are you prepared with a quick and safe method of escape?